The Collecting Sports Cards Online Store Card Shop where we are your expert authority on modern Baseball Cards, Sports and Non-Sports Trading Card Singles, Including Baseball Cards, Football Cards, Basketball Cards, Hockey Cards and lots More. We list our cards for sale by team and then set but you can always use our site search to find the card your looking for by year, brand card number or name. We have hundreds of thousands of more cards to list and are listing more everyday so check back often or bookmark us so you don't miss out on cards you need for your collection. Feel free to browse our site like a museum to reminisce and fell the nostalgia from when you were younger or use the site like a price guide to see what your cards are worth. All of our cards on the site are pictured to give you a better shopping experience. Collecting Sports Cards is run by The Baseball Card Shop in Hermitage Pa. When You order 1 to 6 cards they will ship In a Plain White Envelope at a flat rate of $1.50, Order 7 or more cards and they ship in 1st Class Package for a Flat Rate of $3.50. Pay with PayPal or use your credit card through PayPal with no account required. For Team Sets, Boxes, Packs, Supplies and a whole lot more Please Visit our sister site The Baseball Card Shop Online Store I'm sorry orders from the two sites can not be combined. eBay Users Click Here and Shop to Help Support The Baseball Card Shop eBay buyers can help us keep our doors open even if they don't find anything on our site they need or want at this time. eBay will pay us a small percent of anything purchased on eBay, that's any products from any sellers on eBay US not just sports cards but anything. When you click on the link to eBay on this page and buy anything in the next day on eBay. So please come to our main page and click on the link before shopping on eBay. You will need to do this for each different day you shop eBay for us to get the commission. Thank You. Just as baseball is and has always been called America's pass time collecting baseball cards and other sports cards is called America's hobby. Collecting Baseball Cards and Sports Cards is a fun, exciting and educational hobby that can last a lifetime and there are as many different ways to collect as there are types of collectors. Some people think of sports cards only as baseball cards but there is a whole lot more to choose from than just baseball cards. Many people collect cards by building sets while other collectors choose to focus on a particular team or players. Some people only collect baseball cards or football cards while others may only collect hockey or basketball cards. Many hobbyists collect only cards from one manufacturer. In the end the choice is all up to you because there is no right or wrong way to collecting sports cards. The only thing that matters is that you have fun with your hobby and enjoy yourself and have cards you are proud to show off. WHAT ARE THE BEST CARDS TO COLLECT? Everyone always wants to know and often ask the card dealers which is the best brand/type of cards to collect. If only there was one simple answer to that question it would make it easier on everyone. The problem is that there is no simple answer. The fact is that every sports card brand is better or the best at one small niche of the hobby. If there was only one best brand of cards people would only buy that brand and all the other makers would be out of business. Topps are collected by more people than any other type because they have been making cards the longest and are the type most people first stared collecting. Bowman may be the best for people who like to collect rookie cards but kids may not know most of the players in the set because usually 75% of the Bowman baseball cards are rookies and prospects many of whom are still in minor leagues. Other brands like Upper Deck, Fleer, Donruss, and Pacific (there are to many to list them all) may have great inserts, better photos or better card stock, be more rare and the list goes on and on to what each brand of cards is best at. To make it even more complicated all of the companies are always tring to improve their cards and every year make tweaks to their different brands so the brand that was best at one thing one year may not be the next but it may be the best at another aspect. In the end the best set to collect is the one you enjoy collecting the most and has nothing to do with what tweak any particular card maker has made this year. How to obtain sports cards and baseball cards for your collection will depend on your budget and how much time you are willing to spend on your hobby. There are many great online stores like The Baseball Card Shop Online Store where you can buy sports cards for all the major sports by the pack, box, set and by the individual card. Many locations also have nice baseball card or hobby stores where you can shop to add cards to your collection. 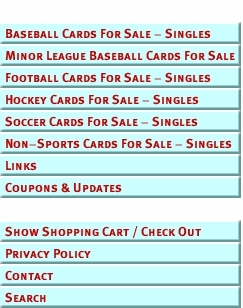 There are also card shows where many dealers will set up to sell there cards. The card shows last only a very short time usually a couple of days or a week a the most. These can be good places to find those cards you seem to have been looking for forever. Buying cards is not the only way to build your collection. Often family members or friends will have cards that they do not know what to do with and just letting people know that you are a collector can net you a large amount of cards for your collection. Many times people do not know what to buy for birthday or Christmas presents so by letting them know you are a card collector you can both win, making their shopping easier and by you getting a gift that you will really enjoy. Another avenue you may want to explore is trading cards with other collectors you know or trading online with collectors. Trading cards is not only a way to get the cards you are looking for and to get rid of extras, it can also be a way to increase the size and value of your collection without spending much of your hard earned cash. Many of the people trading cards are trying to trade for the cards they need to complete sets or add to the favorite team or players collection and that can be to your advantage. There are many times when collectors are willing to trade more cards or more valuable cards to get the cards they need or want for their collection. By trading with people looking for particular cards you can often make deals where you get three times the value of your card or cards in trade. If you spend enough time and do enough trades over time your collection could be worth big bucks. HOW CAN I OBTAIN CARDS FROM PAST YEARS? With all years of sports cards the manufactures only make the cards for the current year and never make more or sell cards from past years so the only way to obtain past years cards or sets is to find a dealer or collector that has them available for sell or trade. In most instances there is no way for your local card dealer to order the older cards for you. You will need to hunt for the items you want at local or online sports card store, card shows, or by checking with other collectors you know. Many people seem to be concerned with how much their collection is worth or what the value is on a particular sports card. It is very hard if not impossible to put an exact dollar amount for the value of any collection or card because there are to many variables and cards do not always sell for the same price. There are many price guides that list values for sports cards and most of them can give you a general idea of what cards are worth but since the value is determined by supply and demand (the amount of cards that were made and available for sale and the amount of people looking to obtain them), the price guides can only be used as a guide an not an absolute value or price. Lets use a Derek Jeter Topps rookie card as an example. It may list in the price guide at fifteen dollars but in New York City it may sell easily for twenty or even thirty dollars. Many people will get upset and think they are being ripped off when they see prices like that, but that is not the case. What has happened is that the particular card is worth more in New York because the demand for the card is much higher and the supply is much lower. The demand is higher because more people in New York collect cards of the Yankees than what the rest of the country does and the supply is lower because the collectors are less likely to sell or trade the cards of there favorite team. By them same token that same card in a small rural town in Michigan would likely sell for less than fifteen dollars. Basically the value of your sports cards is the dollar amount that someone is willing to pay you for them and not what a price guide reports as an average value for your cards. It is important that you store and handle your cards so that they do not get damaged because even the slightest damage to a card will lower it's value. The good news is that there are many different ways to safely store your cards and as long as it protects them from being damaged there is no right or wrong way. Some people store their sports cards in pages and albums so that they can safely look at them anytime they want, while others may prefer to have their cards in storage boxes and or in soft sleeves & top load card holders. Many collectors will use a screw down holders or snap tight holders for the better cards. Most of your sports card supplies will need to be purchased from a hobby store or online store like The Baseball Card Shop Online Store because it is difficult if not impossible to trade for supplies. The way you store your sports cards will depend on your own personal preferences and if you want to display your cards so others can see them.